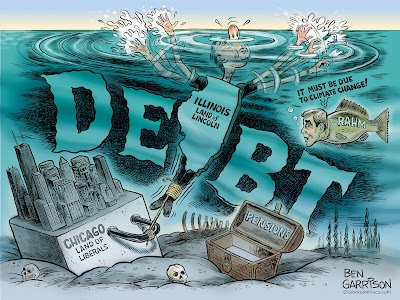 Rogue Cartoonist: "Drowning In Debt"
Illinois is in a bad state. Oh, it’s not a bad state per se—it is, after all "The Land of Lincoln.” There are plenty of good people there—especially in the rural areas. It’s not their fault that they’re burdened with the city of Chicago. It’s a place long-known for its corruption and profligate spending. It has now reached an end game and there’s not enough money to keep the farce going. Eventually, other people’s money runs out. Now they can’t cover city operating costs if they want to cover the massive pension obligations--and they must do the latter because it’s mandated by their state constitution. Chicago Mayor Rahm Emmanuel is a colossal failure. His solution to the runaway murder rate in his city? He calls for even more gun control. His solution to the fiscal crisis is to go deeper in debt. To help salvage his damaged reputation, the mayor went into virtue signaling mode and denounced President Trump over ‘climate change.’ Instead of facing the gigantic problems in his city, he trumpets the climate change farce. Hey Rahm—you can’t even save Chicago. Forget about saving the ‘planet.’ Rahm vowed his sanctuary city will adopt the Paris Climate Change Accord regardless. Chicago is also a ‘sanctuary city,’ where illegal immigrants are shielded and supported—federal law be damned. High taxes, statist micromanagement, and chronic overspending may help liberal politicians look good over the short term, but it destroys the wealth of the people over the long term. Socialism or progressivism or whatever else they want to call it these days never works well over the long term. We recently saw it fail in Venezuela and then Puerto Rico. Chicago will fail next and it will take Illinois down with it.